The debate has been great in my mind. Do I quit the gym and put the savings toward paying off our debt, or do I keep reaping the benefits of the gym life because I truly feel better afterwards? Working out has truly become more than fitness or appearance for me. Now it’s more about stress relieving and keeping my sanity. Sometimes I like weights, sometimes I need to cool it down with yoga or pump it up with a kickboxing class. Whatever I have needed, my gym has had my back. But that doesn’t mean I don’t cringe when the bill comes each month. Then I found out there was a way to quit my high paying gym membership and still get high quality training and the variety that I love. PLUS you get 30 days totally free!! *This is a sponsored post containing affiliate links. Like I said, the cost of our gym membership is pricey. The average cost in America is right around $69 per month and if you have a family, chances are you pay double that! I know we do. Even though you could easily start a home gym for that same one month membership fee. A lot of times, this big cost actually deters people from joining the gym or even working on their fitness at all. What I’m saying is, some gym memberships can really leave you hurting financially, but what’s the alternative? Check out Aaptiv FREE for 30 days! For many people who can’t seem to carve out the time or money to make it to the gym, there is always the option to do the at-home workout. There are YouTube videos, workout DVDs…you name it. Personally, I struggle to workout at home . Don’t get me wrong, I still do it when I need to get a workout in, but I struggle more than I do at the gym itself. It’s hard to keep motivated and not get distracted by other things I have to do around the house. The gym is my jam most days. My kids are cared for and I have weights, bikes, treadmills and classes totally at my disposal. However, I wasn’t always this pumped about the gym. Before I met my husband I didn’t know how to do anything. I felt like everyone was staring at me and that I was doing everything all wrong. It can be a real bummer and that’s why I think most gym newbies stick to the treadmill and then burn out on boredom. I mean…it’s the treadmill. 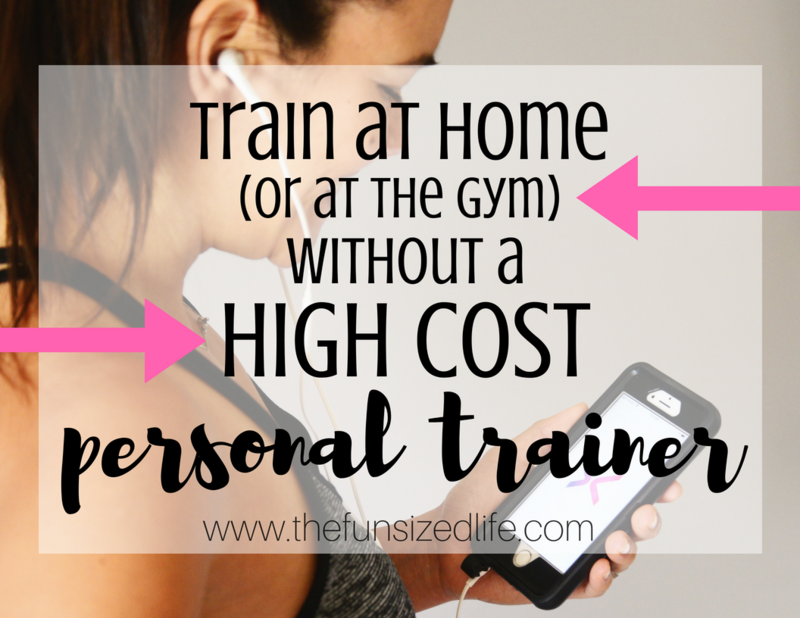 Maybe you have the means to hire a personal trainer? Chances are, you don’t. If you’re already paying close to $100 per month just for a membership, the additional $100 or so training sessions can add up really fast. If you have thought about all these things, workout struggles, the cost of the gym and personal trainers, you are not alone. That’s why there is now a crazy easy solution. Aaptiv is an app that was created for people to use at home, at the gym or on the go. You work at your pace, on your schedule and get training where you want it! I took part in Aaptiv’s 30-day free trial and absolutely loved it. Once I logged in and set up my personal goals, Aaptiv showed me their top recommendations for workouts that I would love. The huge variety of workouts blew me away. They had weight-free workouts, yoga and meditation trainers that could help me at home with no equipment necessary. I kind of figured they would, but the variety still blew me away. Not only that, but my kids loved doing it with me! Sure, it’s easy to stick them in the child care area and enjoy a workout to myself, but getting them psyched about working out felt so much better! Plus, they did a few meditation sessions with me as well! I mean, marathon training? Really? Personally, I don’t ever want to run a marathon, but my husband has talked about it a lot. The one thing that set him back was the intense training required. Get Aaptiv FREE for 30 days! At first, I didn’t understand why Aaptiv would choose to teach fitness without actually having any visuals. Then I started to realize how much those visuals actually slow me down. I spend most of my time squinting at the screen and trying to make my workout look just like the professional fitness trainer on the video. Let’s be honest, that never happens. Workouts vary in time length — this is huge for me since sometimes I only have 10-20 minutes to get my fitness in for the day! The one downside I personally faced was not having the visuals at times. For the most part, the trainers do a great job of explaining each workout before it starts, but I couldn’t help but be a little unsure of myself. Still, as I said, the alternative would be to see the exact move and then panic that I’m doing it all wrong. With Aaptiv, even when I was unsure, I just kept on moving and sweating which is really what it’s all about after all. Just like the rest of the program, Aaptiv’s totally affordable price blew me away! I could purchase an entire year for less than one month of our current gym membership. Besides that, you can get started with a totally free 30-day trial so there are no contracts to sign and no risk to you at all. Using Aaptiv I could easily quit our high-priced gym membership, get a more affordable gym membership, pay less each month and get training totally catered to me!